Inside Talibanistan (Michael Rosenfeld 2007) is a fear driven, made for American television documentary which promises to deliver uninhibited access to exclusive footage from areas where, “no journalist has been since 9/11”. Posing as an insightful look at the operations of allied forces as they close the clamp on clandestine “Tʼs” (the nickname for terrorists) who are hiding in the remote, mountainous landscape of the Pakistan and Afghanistan border, the viewer is instead fed a rehashing of stock footage that reignites the idea all Islamists are a potential ʻTʼ and should be feared. The journalistic team, composed of a cameraman and female reporter, join outposts of the Pakistan Army, U.S. Army and the Human Terrain Team (HTT) who have once again turned their attention on Afghanistan and the hunt for Osama bin Laden. It is as if, for a moment, the U.S.A. forgot the initial reason they went to war, after being side tracked with Saddam Hussein and Iraq, they have now refocused their attention on a Taliban who has had eight years to build a stronger and more deadly army of insurgents who threaten the western world with nuclear warfare by potentially gaining access to Pakistanʼs nuclear program. The most interesting story to emerge from this assumptive driven ʻinvestigationʼ is a segment in which the HTT, a psychological/PR unit who are, “fighting to win [the] hearts and minds away from the Taliban”, explain how they attempted to win the support of a local village by spending USD 1.5 million to build a paved road. The HTT efforts in building the road were thwarted upon discovery they had built it through the villagers ponds and land, the HTT are now negotiating pay for the damage the road has caused. It was at this point it becomes painfully clear to the viewer the efforts of troops are not welcomed, the villagers allegiance lies with neither the coalition nor the enemy. Inside Talibanistan attempts to paint an image of an American and Pakistan led alliance who will be victorious against the insurgents. It promises hi-concept assumptions and revelations, interview segments from leading generals in the U.S. Army help to sell a patriotic view of a just war. 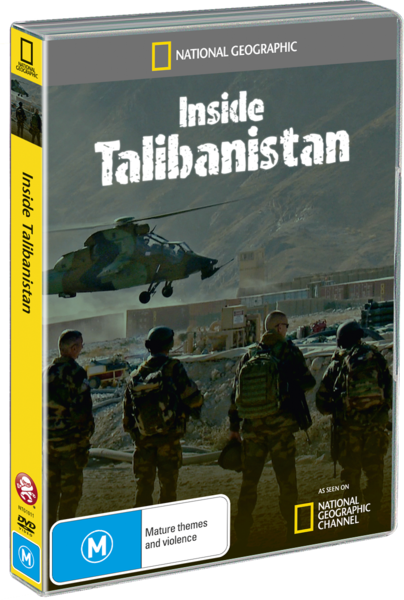 In reality, Inside Talibanistan is a languid documentary presenting the routine activities of frustrated troops, trumping up hype through stock footage and falling short in its promises, the reporter uncovers nothing new or “exclusive” and fails to engage on all levels. Relying too much on MTV style editing techniques, dramatic narration using familiar phrases to build fear in the viewer, unless you have a special interest in American propaganda I would avoid Inside Talibanistan, you would gain more insight about Americaʼs efforts in fighting a strengthening Taliban from watching Bill OʼReilly on FOX. A disappointing but an ʻas expectedʼ production from a politically correct National Geographic.